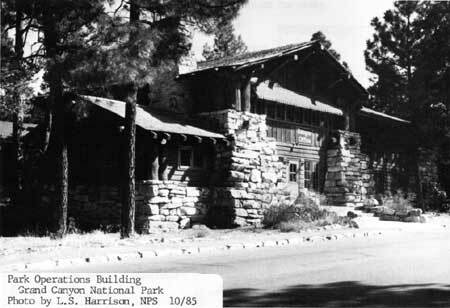 Grand Canyon Park Operations Building, Grand Canyon NP, 1985. The Grand Canyon Park Operations Building is a two-story stone and wood-frame structure of classic rustic design. The building is one of the key park service structures comprising the Grand Canyon Village Historic District which is listed in the National Register of Historic Places. The park operations building is subdued in its architecture when compared with the more outlandish concessions structures built at the Canyon by the Santa Fe Railway, but its fine design shines through in the strength of its architecture. The building was constructed in 1929 as the new park headquarters, removing that function from the 1921 Superintendent's residence nearby. The first floor of the building up to sill height and the structure's corner piers are of coursed rubble masonry with a cement mortar. The remainder of the superstructure is of wood-frame construction with horizontal siding sheathing the first floor and vertical siding covering the second story walls. A 1938 addition at the north end of the building houses restrooms and is constructed of the same materials and in the same style as the main structure. The stone piers on the building's corners each support three peeled logs that define those corner. The piers are stepped in a battered fashion. The peeled logs are the same diameter as the surrounding pine trees. The gable roof of the central portion of the building runs east-west and intersects the gable roof of the southern wing that runs north-south. The roof of the 1938 addition at the north end of the building also runs in a north-south direction and abuts the wall of the central portion below the eaves and encircles the central chimney. All of the roofs are finished with wood shingles. The exaggerated eaves that extend several feet out from the building's walls have axe-cut brackets and outlookers that extend out beyond the sheltering roofs. The principal entrance to the building is through the central bay, where enormous stone piers flank the symmetrical entrance of a central door with paired casements on either side. Stone steps lead up to that entrance. Curbing along the street in front of the building and bordering the sidewalk are also stone. The interior was remodelled in 1938 and several times since then. The only remaining interior fabric of included in this nomination is in the lobby and in areas directly adjacent to it. The stone fireplace is articulated by stone piers of coursed rubble masonry that are topped by peeled logs supporting a log ceiling beam. The hearth is stone. Walls and ceiling are covered with log slab siding giving the building a particularly rustic feeling. The log slabs run vertically creating a three-foot wainscot, and then run horizontally. The original wood floor is covered with wall-to-wall carpeting that is removable. Fluorescent ceiling lights have been added to the room. Directly off the lobby is a wood staircase finished with log slab siding. The original 1938 doors to the restrooms flank the fireplace. The latest park headquarters building constructed in 1967 resulted in a slight change in use. The structure now houses offices for law enforcement rangers only rather than offices for the majority of the park staff. An aluminum awning, painted brown, was added to shelter the second-story windows from the late afternoon sun. The awning is painted brown to match the existing siding, and is removable with no damage to the historic fabric. Other recent changes include the installation of fluorescent lighting and new partitions in the office spaces; the addition of a large metal sign denoting "Ranger Office" over the main entrance to the building; the replacement of the south side door with a fireproof higher security type of door; and the construction of a removable shed-roofed wood frame partition at the rear (east) of the building. Any fabric added to the structure after 1938, with the exception of replacement-in-kind of original materials is not included in this nomination. The Grand Canyon Park Operations Building is a prime example of a rustic structure designed by the National Park Service Landscape Division. While concessioners like the Santa Fe Railway sought to make their architecture distinctive, identifiable, unique, and memorable often through contrived design, the National Park Service architects and landscape architects pursued a type of design that had primary emphasis on harmony with the natural surroundings. Just a short distance away from the park operations building at Grand Canyon the Santa Fe's concessioner, the Fred Harvey Company, used a "Norwegian-Swiss villa" style for El Tovar, and a copy of a Hopi pueblo structure for the gift shop Hopi House. The use of known and accepted architectural styles and the consequent use of applied ornament on park service buildings was lacking for the most part. The "ornament" instead became the texture of the stonework and its rough courses mimicking the local geology; the log piers defining the building's corners with the same diameter as the trees of the surrounding forest; and the low-pitched roofs with their log outlookers that diminished the mass of the building. The "style" of the building was created by those natural-feeling forms and materials that tied the structure with its environment. From its creation in 1916, one effort of the National Park Service had been to seek an architecture appropriate for construction in some of the most scenic areas of the United States--the national parks. The first directive put out by the new agency stressed that in any development in a national park "particular attention must be devoted always to the harmonizing of these improvement with the landscape." The directive also stated that the employment of "trained engineers who either possess a knowledge of landscape architecture or have a proper appreciation of the esthetic value of park lands" was a key item in all programs of park development. During the late 1920s the increase in appropriations for physical improvements to national parks meant an increase in staff to design and oversee the construction of those improvements. Under the direction of landscape architect Thomas C. Vint the park service landscape division grew from a two-person operation to a six-person operation in 1927 alone, and this was just the beginning of an enormous expansion that continued up until World War II. Thomas Vint received his Bachelor's in landscape architecture from the University of California (Berkeley) just before World War I. During the war he took advantage of the opportunity of studying architecture and landscape architecture at L'Universite de Lyons while he was stationed in France. After working for several private firms Vint joined the park service in 1922. During this extremely formative stage in park architecture Vint had close working relationships with architect Gilbert Stanley Underwood, designer of the Ahwahnee and a number of lodges for the Union Pacific Railroad, and with Herbert Maier, at that time architect of the Yellowstone museums for the Laura Spelman Rockefeller Foundation. Vint instilled in his architects and landscape architects his sensitivity for the unique natural surroundings of each structure designed by that office. The small budgets for the building projects constructed between 1928 and 1932, however, did not result in a meagerness of design. The designs of that time period, of which the park operations building was a product, had an architectural strength and purpose unusual in smaller public facilities. The massive stone piers stepped up the corners of the building like the natural rock outcroppings of the canyon. The peeled log corner posts matched the diameter of the pine trees in the lot where the building was constructed. The low pitches of the roofs brought a ground-hugging horizontal emphasis to the structure. The large overhang of the eaves added shadows that darkened the already dark walls and helped the building's mass recede into shadow. The texture of the stonework and the deep-set mortar created even more of a play between light and shade, just like the variety of it found in nature. The way the building was slightly banked into the gentle grade as it sloped down toward the north added to the building's response to the topography. Even the dark brown of the siding and the green trim around the doors and windows was a decision made with the utmost care to blending the structure in with its natural environment. The choices made by the designer of the park operations building were careful ones, steeped in a design philosophy that had evolved through years of architectural experiments by concessioners and, after 1916, the park service. The park operations building was one of the highly successful design solutions to the problem of an aesthetically appropriate architecture for a national park. 1 William Tweed, Laura Soullière, and Henry Law, National Park Service Rustic Architecture: 1916-1942 (San Francisco: National Park Service, 1977), p. 23, quoting from the 1918 Report of the Director of the National Park Service to the Secretary of the Interior. Tweed, William C., Laura E. Soullière and Henry G. Law, National Park Service Rustic Architecture: 1916-1942, San Francisco: National Park Service, Wetern Regional Office, 1977. USNPS files including National Register and microfiche files, Western Regional Office, San Francisco. The boundary runs along the south edge of the road on the Building's north side, along the east edge of the road on the buildings west side, and then 15 feet out from and parallel to the building walls on the south and east sides, with the eastern side of the boundary continuing north to the south edge of the road back to the starting point. 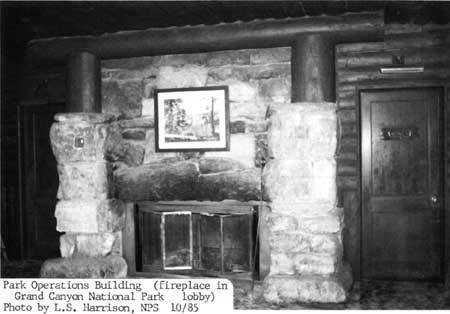 Grand Canyon Park Operations Building (fireplace in lobby), Grand Canyon NP, 1985.